There is always a lot of discussion and speculation in various Bitcoin forums trying to figure out when big institutional money such as hedge funds and major private equity groups are going to start moving into the Bitcoin space. The reasons for this are obvious. These funds command trillions in wealth worldwide and even speculative positions from these players could have a major effect on the price and market cap of bitcoin. However, it could be retail investors and smaller investment groups that fuel the next price rise ahead of major institutional money. This article will take a look at why the market may not be ready yet for big institutional towards the end, but first let’s look at why retail investors may be set to enter the market. Having worked at a major UK brokerage in 2013 as an investment consultant, I spent every day consulting with retail investors which provided me with a great insight into their investing behaviour. From my experience here are some of the reasons I believe they may soon look to invest in the Bitcoin market. Brokerages offer a huge amount of Funds and Multi Manager Funds (funds that invest in other funds) they are an extremely popular investment vehicle for retail investors. The reason they are so popular is because many retail investors are very passive by nature, this is partly contributed to by the fact that many have full time jobs and in many cases they don’t have the time or interest to carry out in-depth research on many individual investments. It provides them with exposure to multiple types of investments, through one low maintenance security that is professionally managed for a small premium. During the last bull run in Bitcoin during Q4 2013, there were no secondary market Bitcoin funds for retail investors, but this looks set to change towards Q3 and Q4 of 2014. CEO Barry Silbert of SecondMarket Holdings, Inc, the company that set up the Bitcoin Investment Trust (BIT), have indicated that they are looking to expand the scope of their operations to make funds available for retail investors hopefully by Q4 this year. In addition to this the Winklevoss twins are also well into the process of getting approval for their ‘Winklevoss Bitcoin Trust’ an exchange traded fund (ETF) which looks like it will list on the NASDAQ. Whilst it’s difficult to estimate when the regulatory process will be completed for the ETF, many commentators believe it could be finalised by Q4 2014 if not by early 2015. The creation of these funds may help usher in a new wave of retail investment and the successful completion of the funds may be a catalyst for the creation of more Bitcoin secondary market funds in the future. The fact is the majority of retail investors always wait for the confirmation of a trend before investing, as retail investors by their nature are more risk averse less and less likely to be part of the ‘smart money’ that invests early in high risk investments. Whilst Bitcoin is without a doubt still a high risk speculative investment, it has now been around for 5 ½ years and the Bitcoin economy continues to mature every day. With another potential move back above $1000 as many analysts are predicting in 2014, this may give the confidence that retail investors need to enter the market. There are only so many times you can declare an asset is dead, after a price correction, before seeing it go to new highs to provide retail investors with the confidence they need to enter the market. Whilst I have heard arguments from some early bitcoin investors that a higher bitcoin price may deter retail investors as the thought of spending 4 figures on a single bitcoin may not seem attractive. There are many reasons why this may not be the case. One reason as we discussed earlier is to do with the secondary market funds. For example whilst a $1000 bitcoin price seems expensive for a single bitcoin, investing $2000 in a ETF and receiving 100 shares may sound more attractive than buying 2 single bitcoins. Along the same lines, the proposal of changing the pricing of bitcoin to ‘Millibits’ (mBTC), may have the same psychological affect. For example buying 1,500 mBTC for $1500 may sound more appealing to a retail investor than purchasing 1.5 BTC. During the late 2013 run up in the bitcoin price, there is one correlation I really noticed whilst working as an Investment Consultant that led me to believe that retail investors are much more reliant upon mainstream media (MSM) for their investment decisions. It was not until the price started to reach $1000 dollars that we started to get multiple enquires of how and if clients were able to invest in Bitcoin whilst working at the brokerage. This coincided with growing coverage in the MSM from sites such as CNBC , Bloomberg and Reuters as the price reached this distinct milestone. The charts below show the google trend searches for ‘Bitcoin’ V the Bitcoin price as it neared and surpassed $1000. It could be argued that a move back into the $1000 will likely ignite the MSM coverage again and increase interest from retail investors. Coupled with the fact that many retail investors will be more aware of Bitcoin from the previous spike and may soon have investment vehicles thy can then use to invest. This may lead to an influx of retail capital into the Bitcoin space. 2014 has currently seen a significant slowdown in equity market returns globally, compared to recent years. It is these equities that currently make up a large percentage of many investment Funds and Multi Manager funds offered by major brokerages. Whilst it is extremely difficult to gauge the future direction of the markets, due to massive market distortions from the likes of the Federal reserve through QE and their Permanent Open Market Operations (POMO). The decline in macroeconomic data and the appearance of tapering of these tools has currently led to weaker equity markets in 2014. If this trend continues and ROI continues to lag for equities, we may see much more interest from retail invest towards Bitcoin. The reason for this is that during my time working as an Investment Consultant I noticed that retail investors in many cases use 4 main metrics when looking for an investment fund. If these metrics start to decline for equity heavy weighted funds and the Bitcoin market continues its growth trend. We could potentially see a lot of money move out of these funds into Bitcoin specific funds (and or) other funds start to weight their portfolios to include Bitcoin funds (dependant on fund remit & regulation). Whilst there are many potential variables to all the points above, there are a lot of reasons why retail investment may soon come into the Bitcoin space and help fuel the next possible upside move in Bitcoin. A move back above $1000 and new secondary market funds would definitely be a great catalyst to start the process and this could lead to a much higher bitcoin price and market capitalisation. The reason this is important is because this is of the main pre-requisites and incentives big institutional money like hedge funds and major private equity groups need to get involved in the market. In addition to this, without liquidity it is extremely difficult for big players to move in and out of the market without dramatically affecting the buy and sell price. Executing a bid or ask price in the tens of millions on any of the current main exchanges, would take out a huge amount of bids and asks in the order book. This would lead to a much higher buy price or much lower sell price when trying to execute a trade. However, improved liquidity coupled with improved infrastructure, and derivative products for hedging could see the big institutional money start to invest in bitcoin and that could potentially take us closer to the much anticipated S-Curve adoption in the future. I do not have any affiliations with the funds/products mentioned in this article. This article should not be viewed as an endorsement of the funds/products discussed. Please carry out your own extensive research before considering investing in any funds/products mentioned in this article. Regardless of a merchants underlying ideological stance towards Bitcoin, there are many reasons why acceptance of Bitcoin through merchant processors such as ‘Bitpay’ and ‘Coinbase’, can provide both value for the merchant and increase the value of the underlying Bitcoin network as a whole in a relatively low risk way. The basic understanding of ‘value’ is the regard that something is held to deserve; the importance, worth, or usefulness of something. 1) It opens up businesses to a wider market audience and pool of capital. The bitcoin market cap has seen highs of $14 billion and is projected by many analysts to be many multiples of this in the future. On top of this the user base for Bitcoin looks to be growing at an ever increasing rate. 2) It lowers their transaction costs for purchases with Bitcoin by 50%-66% based on a <= 1% transaction fee (volume dependant) compared to in the region of 2%-3% charged by debit card and Credit card companies. 3) Time is money – It saves merchants time on the processing of transactions. Please see my article Bitcon V UK Retail Banking for an example of how much time Bitcoin transactions can save. 4) Being at the forefront of Bitcoin adoption, merchants have opportunities for free advertising and media coverage not only in the mainstream media, but also in the alternate media and on social media platforms. 5) Merchants that adopt bitcoin for payments are seen as pioneering, trendy and in touch with the digital age, to a growing technologically orientated populace. 6) Many merchants have benefited from the support and passion of the Bitcoin community, that have been very supportive of companies that accept bitcoin. A good example of this is Overstock.com where Patrick Byrne CEO recently reported $1.6 million in bitcoin sales and states that bitcoin purchases are growing by 25% a month. 1) It adds to the services and products that can be purchased using Bitcoin, thus increasing the ‘utility’ of the currency which is a major attribute that provides Bitcoin with value. 2) In the case of EuroPac Precious metals, Bitcoin gains from the perception of having a highly respected investor and public figure accepting payments in bitcoin. This increases its validity in the eyes of sceptics and people less informed on Bitcoin as a whole. 3) With every merchant acceptance of Bitcoin, it makes it more desirable purchase the currency because of increased utility and boosts the network effect that increases the chances of Bitcoin reaching large adoption. 4) The ‘Amount of transactions’ on the Bitcoin network is an important metric in analysing the health of the Bitcoin economy and one of the indicators used for potential investment. Increased merchant adoption will likely have the same effect on the amount of transactions. 5) Companies that accept bitcoin payments have the potential to create margin compression for other companies in the same industry, as reduced transaction fees enable savings to be passed onto consumers. This creates an incentive for all other companies in the same sector to adopt Bitcoin to stay competitive. This has the potential to create a snowball effect of facilitating Bitcoin payments within many industries. The important thing to look at here for all merchants and investors looking to adopt or invest in Bitcoin, is the underlying symbiotic relationship where both the merchants and the value of the Bitcoin network benefit from the adoption of Bitcoin by merchants. One of the biggest criticisms I hear at the moment is the fact that merchants are not really supporting Bitcoin, or do not see the value of Bitcoin if they immediately convert back into fiat currency. But as we have seen above, there are a lot more factors to consider than just the currency conversion. For me the conversion back into Fiat currency when adopting Bitcoin represents ‘Phase 1’ of merchant acceptance and companies like ‘BitPay’ and ‘Coinbase’ provide a good way to hedge against current price volatility that is undoubtedly present in the market and will be for the foreseeable future. As Bitcoin matures leading to a possible increase in market cap and reduced volatility, this could potentially lead to ‘Phase 2’ where merchants begin to reduce the percentage of Bitcoin they convert back into fiat currency. We have already began to see this at Overstock.com as CEO Patrick Byrne recently stated, they are now holding onto 10% of all Bitcoin transactions in Bitcoin. ‘Phase 2’ also has the possibility to alleviate the potential impact of another talked about problem, that converting Bitcoin transactions straight to fiat currency puts sell side pressure on the exchanges. If you like Bitcoin or not, every merchant can find value by accepting bitcoin and by looking at the points above, everyone in the Bitcoin space can potentially benefit from increased merchant adoption. There is also a good case to be made that those merchants that do act early will potentially see the biggest amount of benefits and gains by accepting Bitcoin at this relatively early stage. For centuries banks have provided a medium for the facilitation of financial transactions domestically and internationally. During this time they have provided a necessary service that has helped facilitate the growth of domestic and global commerce. However in the last century especially, it could be argued that the financial services sector has become growingly complacent with archaic infrastructure, considerable fees and a severe deterioration in integrity and trust. The lack of serious competition may have fostered this complacency, however, this all changed with the creation of Bitcoin in 2009. There is no doubt that globally banks are very worried about the competition that Bitcoin offers and for good reason. Bitcoin has the potential to massively disrupt their privileged position as financial/transaction intermediaries that net them billions in commissions and fees every year. However, if bitcoin is to grow into a mass adopted currency, it needs to provide retail users with utility and benefits that go above and beyond the current banking system that currently handles the vast majority of transactions. With a recent study showing that UK consumers are still very sceptical about Bitcoin, now may be a good time to look at this in more detail. It is no secret that due to fractional reserve banking (FRB), banks have rehypothecated thier tier 1 capital multiple times in the UK, much of which has made its way into risk assets. This brings into question if banks actually have the collateral available to back all the bank deposits currently sitting on their balance sheets. In the event of one or more major sovereign defaults and the likely ensuing contagion, it is not difficult to envisage a scenario where the mark to market losses on these risk assets would render one if not more of these institutions insolvent. In an event like this, bitcoin potentially offers a safe haven (similar to physical precious metals) of having an investment without any counterparty risk to the highly leveraged current financial system. Whilst counterparty risk can come from holding bitcoins in third party companies such as exchanges like Mt.Gox. This risk can be mitigated with various hot and cold storage techniques that can greatly reduce or almost eliminate this risk altogether. Around the world, the continuing and accelerating debasement of fiat currencies through FRB and Quantitative Easing (monetisation of sovereign bonds) has accelerated, especially since the financial crisis of 2008 and the bank bailouts that ensued. In the UK currently £375 billion has been pumped into the monetary system by the BOE and the real world effects of this can be seen with asset price inflation creating price rises in fuel, energy, utilities, travel, tuition, house price and rents. The result of this, simply by holding your money in GBP, people’s purchasing power continues to decrease as low interest rates cannot offset losses from a higher rate of inflation. On the other hand, as a currency, bitcoin has a set limit of 21 million units. Whilst bitcoin remains inflationary as bitcoins are rewarded through the mining process, the inflation rate is very slow and as a result, devalued fiat currencies continue to fall in value against bitcoin. One of the major advantages of this is that bitcoin holders possibly have the opportunity to protect their purchasing power from more aggressive devaluation. Having looked at two of the major benefits that Bitcoin could provide going forward, let’s take a closer look at this comparison. 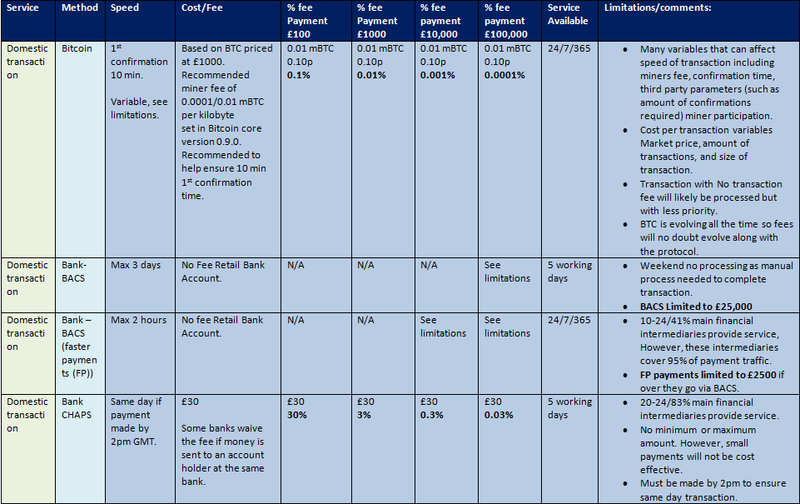 The following information takes a look at how Bitcoin compares against a standard infrastructure and fee structure of a large UK retail bank account. It will look at the most widely used transactional methods used BACS, BACS faster payments, CHAPS and SWIFT, in terms of cost, speed, availability and limitations for Domestic and international payments. A list of all financial institutions that use these methods can be viewed here. The information collected is publicly available information from one major high street bank in the UK. Whilst other banks may differ slightly in there fees structure this information should provide a fairly reliable benchmark across the main players in the industry. Before we review this information, it is worth taking into account that the Bitcoin protocol and bitcoin market factors are changing all the time, so the scope of this information is to give a realistic snap shot in time of what the Bitcoin can potentially offer. Depending on adoption and growth of the bitcoin network these factors are likely to change going forward. At the moment, it is possible to make fee free domestic transactions in the UK through BACS and BACS faster payments with a retail bank deposit account up to the value of around £25,000. A full break down of faster payment limits can be viewed here. For clients sending money between the institutions where faster payments are available, this service actually provides a fairly good cost effective way of sending money domestically in the UK. It is worth noting that Bitcoin transactions can be made without a fee, but the fastest transaction confirmation time of 10 minutes cannot be guaranteed. More detailed information on Bitcoin transaction fees can be found here. Whilst this undercuts the current recommended miner fee of around 0.01 mBTC to help ensure a 10 min transaction using Bitcoin. It could be argued that it is the speed and availability that will make Bitcoin a viable competitor for smaller domestic payments. Further adoption of bitcoin and increased transaction volume could potentially reduce this fee in the future, which would help make micro and small transactions more cost effective in a domestic scenario. One area where Bitcoin clearly offers an advantage is with large, time sensitive transactions that make up the bulk of CHAPS payments in the UK. 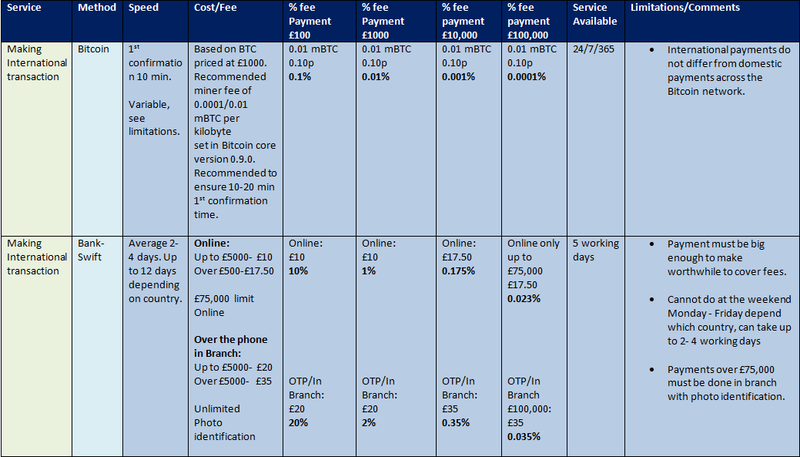 Bitcoin can clearly undercut the speed, availability and average £30 fee charge for this service which is used mainly for payments that are normally above the BACS and BACS faster payment limitations. Speed perhaps most importantly the time for the transaction to clear. At best transactions clear in 2-4 days, but depending on the geographical region of the receiving financial intermediary this can sometimes be as much as 12 days. In addition to this, a widely discussed major benefit of Bitcoin is that it provides a low entry transactional network that opens up commerce for billions of people who are currently unbanked around the world, for reasons that range from geopolitical, to the lack of banking infrastructure in there geographical region. With bitcoin something as simple as a cell phone can be used to transfer bitcoins internationally. Another cost that can be mitigated by Bitcoin altogether is when receiving international payments. Whilst the percentage cost is fairly low for large transactions. When receiving international payments through a retail bank account in the UK, it is the more common smaller payments that incur a noteworthy transaction fee on a cost % basis. Having looked at the difference in transaction speeds across Bitcoin, BACS, BACS – FP, and CHAPS, we can now look at the total time that could potentially be saved per annum, using Bitcoin, based on the amount of transactions for each method and the generally accepted transaction times. Whilst there are many variables, including transactions that clear before the limits shown below for BACS,BACS FP and CHAPS, as well as Bitcoin transaction confirmations that exceed the 10min 1st confirmation time. The following information I believe shows the potential for time saving when using Bitcoin versus the current banking methods. The total amount of transactions shown below is taken from the ‘Annual Summary of payment clearing statistics 2013: Inter-bank and Inter-branch Clearings’ available from the UK payments council. Drawing a comparison in overall time saved when using Bitcoin over the current methods of banking transactions, we can see that the potential time saving when using Bitcoin is huge. It’s easy to conceive just how much time could potentially be saved in the UK alone with the reduced time in waiting for transactions to clear and how this can accelerate the speed in which domestic and global commerce can take place. Whilst the Bitcoin protocol is currently capped at 7 transactions per second with artificial limits to prevent major growth of the Blockchain, before the network is ready for it. These limits can be removed and the amount of transactions that the network can handle is scalable by many multiples, especially with growing computer power which will help facilitate this. If the network continues to increase in size and speed, the potential for being able to facilitate the amount of transactions shown above is not inconceivable. Whilst the UK banking industry still plays a dominating role in facilitating domestic and international transactions in the UK and in some instance, provide a good medium for very low cost transactions. The risks associated with using the banking system in the UK are growing by the day. Coupled with long transaction times and in some case partial availability, Bitcoin looks set to provide much needed competition in the UK retail banking industry, especially with its low cost for domestic and international payments, fast transaction times and 24/7 availability. In addition, the prospective growing need to hold assets that can be used to hedge against counterparty risk and debasement of fiat currency, could see its adoption grow. Whilst it is unlikely to replace the banking system in the near term. On a longer time scale, with further development of key services needed for wide adoption. The scalability of the Protocol and network provide a realistic proposition of Bitcoin having a much larger market share of this industry. Because of this, it is likely we will see a determined effort from these banking institutions and other powerful payment providers to try and slow down and limit the impact of Bitcoin through lobbying, regulation and patent trolling. After the recent Chinese crackdown in particular on Bitcoin exchanges in China, I discussed this fact with Javier Marti, Bitcoin expert, digital trend analyst and CEO of Bitcoin Global Investments. “The difference may be a future in which Bitcoin comes to mass adoption in the medium term, or one where the process is greatly slowed”. Whilst Javier remains optimistic about the potential of Bitcoin going forward. This is something that has to be taken into consideration. Whether you agree with political donations or not, perhaps one of the silver linings for Bitcoin in relation to this, is the recent news that US Politicians can now accept bitcoin donations up to the value of $100, which could lead to similar legislation in other jurisdictions. The future remains to be seen, but Bitcoin has the potential being one of the greatest examples of lean engineering the financial services industry has ever seen, and the fact that Bitcoin is being backed by a tireless community network of developers, entrepreneurs, investors, business minds, journalists and enthusiasts, may help it face up to these head winds. In addition, with the possibility of extreme tail risk in the banking industry, it is possible the adoption of Bitcoin in the future may go from being a ‘want’ to a ‘need’.